Since I'm getting more interested in photography and understanding cameras and techniques, I find myself wanting to know the details under which a photo was taken. Modern digital cameras encode a lot of such data — shutter speed, lens focal length, etc. — into the image file, generally called “Exif Data” (“Exif” stands for “Exchangeable Image File Format” and as an acronym would normally be written as “EXIF”, but the standard creators explicitly say that it should be written “Exif”, which is nice.). As of Dec 2016 this tool has moved to http://exif.regex.info. That's just the summary — you can see the full data using the tool itself. The amount of data encoded in the image is quite variable. Many times there's just about nothing, as the data is stripped somewhere along the way. Here's a version of the previous picture with most data missing. It's missing because it's a smaller version that's meant for web display, and for such use the data just makes the file bigger and slower to download. 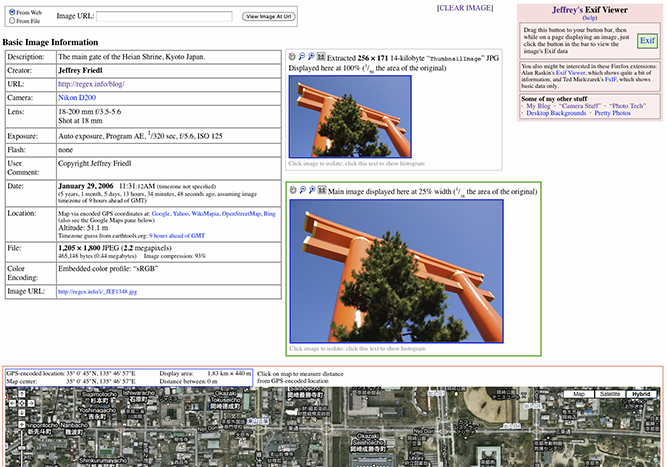 Geoencoded photos get links in the summary area to Google Maps and the like, and below that is an embedded Google Maps pane. With either, you can switch between Satellite and Map, and zoom, etc..
You can also check images on your local hard drive — images directly from a camera generally have the most information. Give it a try! If you're using Firefox or Safari, you have the added benefit that you can install an Exif-viewer button on your button-bar toolbar. Once you've done that, later, when you're viewing a page with an image you want to check out, just click the button and you'll be whisked to a new tab showing the image's data. I find this really useful. It doesn't work in IE, though, sorry. I use the viewer a lot on images I see in the Digital Photography Review Samples and Galleries forum. Lots of nice pictures in there. Many have their Exif data stripped, but many do not. Finally, I should note that my viewer makes use of Phil Harvey's most excellent Image::ExifTool library. Thanks Phil! There is a camera which hash GPS integrated into it. No more manual geocoding. Built-in GPS is cool, but at this stage I don’t think I’d like it built in unless I knew it was at least as good/accurate/fast as the current crop off GPS handhelds. My Nikon D200 can be hooked directly to a GPS unit and automatically encode pictures with the appropriate data…. but I don’t use it that way. (To have something teathered to the camera would be fairly awkard, I think). As for manual geoencoding, I don’t do that, either. What I do: I have my GPS unit keep a track updated every second or so. When I get home, I correlate the data from the track with the pictures (via the picture timestamp). While I’m updating the Exif data with the GPS stuff, I also add my name and copyright and human-readable location info (e.g. Kyoto Japan). The downsides of what I do is that I must be sure that the camera clock is set correctly (the GPS clock will always be correct when its talking to the satellite), and that I must remember to bring my GPS unit, and remember to turn the tracking on, and must be sure that I download the track before its memory fills. I’d certainly like not to have these downsides, but I think it’ll be a while before a built-in GPS unit will be good enough yet small enough to add to a full-size SLR to make it a real value….. Your EXIF tool is fantastic. But I do have a question about how you’re obtaining a timezone offset. I suspect it’s via the XMP headers which I assume are simply set by whatever Adobe program I happen to be using. And set to be the same as the timezone offset of the machine on which the photo was processed. Am I totally off base? The viewer’s timezone stuff is sort of random, because timezone data within the Exif data is random. The Exif standard does not provide for timezones, which is just an amazing oversight as far as I’m concerned. When I asked a member of the committee about it, he asked “why would you need timezone information? Could you give an example where it’d be useful”. Arrrrgh. Some programs do insert timezone info in the data in various ways. Adobe Photoshop assumes all images are in the machine-local timezone, and so adds that timezone (turning data that’s vague into data that’s perhaps wrong). Until there’s clear direction as to what should be done, my online viewer remains sort of random WRT timezone stuff. I should at least update the output to indicate that timezone stuff is random, though…. How do you merge the GPS data? I’ve been thinking of coming up with something like this but it seems like I’d end up manually merging all the data in, which is more work than I want to do at this point. If there were some way to automade adding the GPS info I’d be all for it though. a search and you’ll find some. My Nikon D200 can be hooked directly to a GPS unit and automatically encode pictures with the appropriate data…. but I don’t use it that way. (To have something tethered to the camera would be fairly awkward, I think). Nice tool. We use it in our photography forum. Thanks. I have a picture with blacked info, which is uploaded , And posted. I would like to know if iT Is possible to get THE picture without anything on iT ? I’m having a discussion with tech support at Topaz. They apparently use your EXIF viewing tool. They have sent me a screen capture to make a relevant point which I won’t bother you with. In a box labeled “Color Encoding:” there appears a warning. It says “Color space tagged as AdobeRGB, without an embedded color profile…” The file is a (Canon 5d3) raw file. The tagged color space is, of course, for the associated JPEG file, if present, and the embedded thumbnail. In my understanding, raw files do not have embedded profiles. It is up to the raw file interpreter (Adobe Raw, DCRAW, RawDigger, DXO, etc.) to provide camera specific profiles to interpret the raw data while demosaicing, etc. to produce a viewable image file. What is the meaning of the Color Encoding box and the warning? Thanks.